Kirk Bell April 10, 2017 Comment Now! 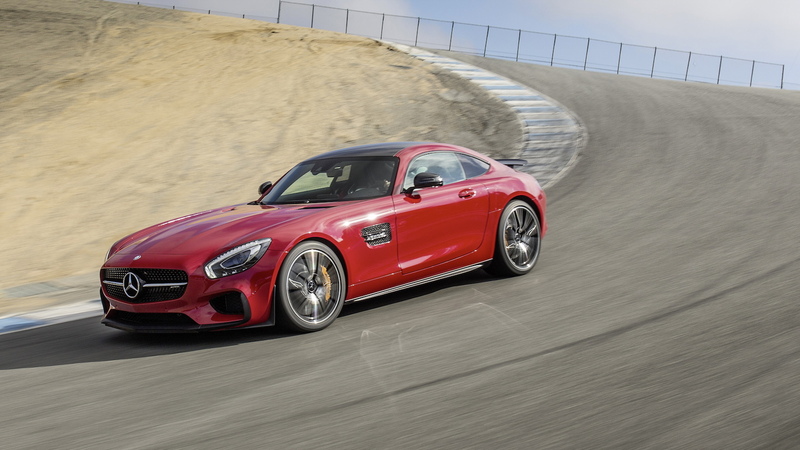 Mercedes' AMG arm is attacking just about every vehicle in the German automaker's lineup, giving the brand's luxury vehicles various levels of performance with a series of 63 and 43 offerings. 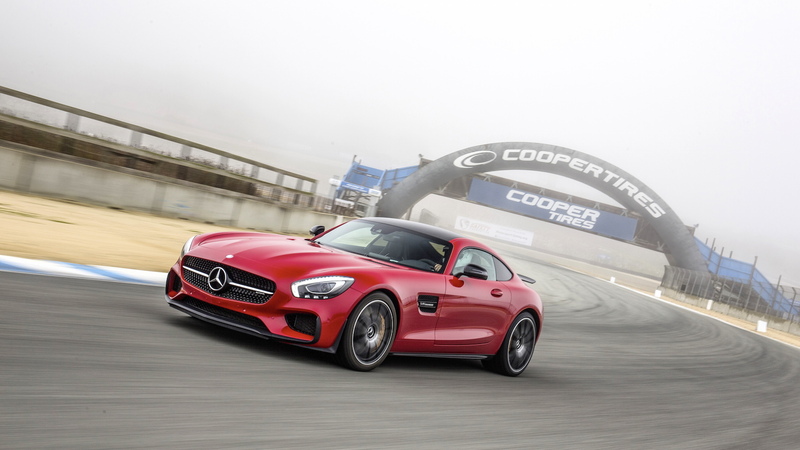 However, it's the two cars that AMG has developed from scratch that have pushed the bounds of how far Mercedes can go toward building a sports car or even a supercar. Those cars are the SLS AMG that made its debut in 2010 and the newer AMG GT, which was released as a 2016 model as a coupe and now gets a 2017 roadster companion. The SLS and the GT are actually related. They both ride on the same basic platform, though the GT's is evolved considerably from that of the SLS. The basic structure features an aluminum spaceframe with a center tunnel, a torque tube, a carbon fiber driveshaft, and a rear transaxle. The cars each feature long hood and set back greenhouses, too, and yet, they drive very differently. The SLS AMG, with its 563-horsepower, naturally aspirated 6.2-liter V-8, was a beast. It crackled and snarled, and it's handling, while certainly track-worthy, gained a reputation for being tail happy. Hit the throttle too early coming out of a corner and you wouldn't come out of it so much as make it a 360-degree turn. The SLS was also unique in that it revived the gullwing doors from the original 300SL of the 1950s. The GT is more of a pure sports car. The tail happiness is gone, replaced by a hunkered down feel that makes it a viable competitor for the vaunted Porsche 911. The big cubic-inch V-8 is gone, too, replaced by a twin-turbocharged 4.0-liter V-8 in states of tune ranging from 469 to 577 horsepower. At the recent Mercedes-AMG GT C Roadster launch in Arizona, I sat down with Axel Wolleson, overall vehicle development engineer for Mercedes-AMG to discuss how the SLS evolved into the GT and why the cars feel so different. Perhaps the biggest difference between the two cars is their length. 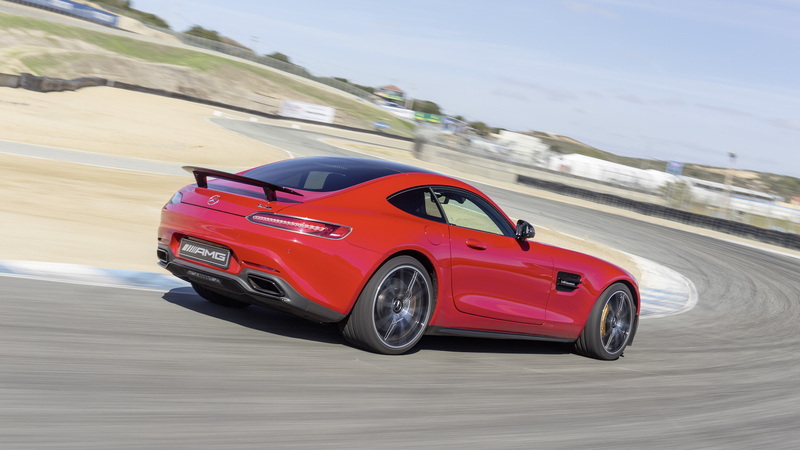 "The difference between the SLS and the GT is, for example, the decreased wheelbase," Wolleson said. The GT is shorter by 50 millimeters [1.97 inches], and in overall length, the GT is 90 mil [3.54 inches] shorter than the SLS. That means that we had a complete different package in the front area." The length was removed from the bulkhead forward. The smaller-displacement V-8 engine was going to be shorter, so the front end could be shorter. Still, the addition of turbocharging presented some challenges. "We had a much more complex package in the front because a turbocharged engine needs a lot of more efforts for cooling," Wolleson explained. Cutting down the length meant cutting some weight. Chop out some of the structure and weight goes with it. The SLS's gullwing doors also added weight where you don't want it: up high. "In the SLS, we've got a massive structure in the roof for the gullwing doors. In the GT coupe we have an aluminum greenhouse," Wolleson said. A component at the front of the car also cut some weight while improving fit. AMG added a magnesium crossmember to the front end in place of several aluminum parts. This piece provides a mounting point for the headlights, front bumper, and other small parts. As a single piece, it provides an advantage for fit tolerances. All told, the changes took about 66 pounds out of the body in white, and they had another benefit, too. "All these changes affect the character of the car in that the center of gravity becomes about 10 mil lower, which is a lot, and this gives us better driving performance," Wolleson noted. All told, the GT lost 150 to 200 pounds compared to the SLS, depending o the model. The shorter length and smaller engine changed the weight balance slightly: from 46/54 rear biased in the SLS to a bit more neutral at 47/53 in the GT. 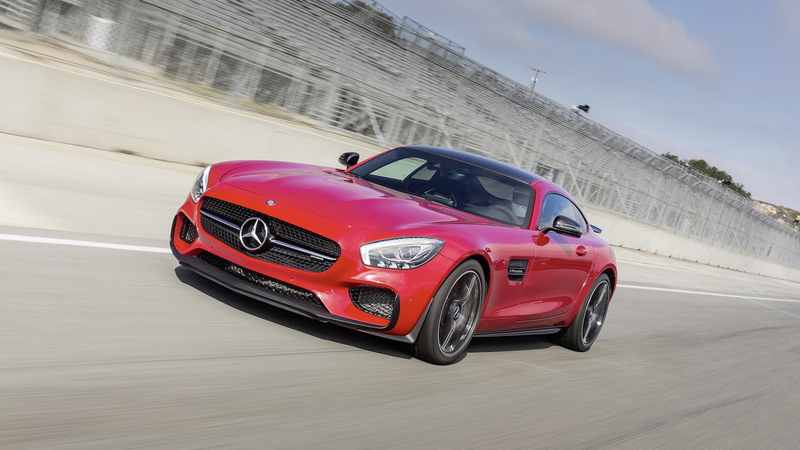 For the 2013 model year, the SLS AMG GT base model cost $202,505, including destination and gas-guzzler tax. 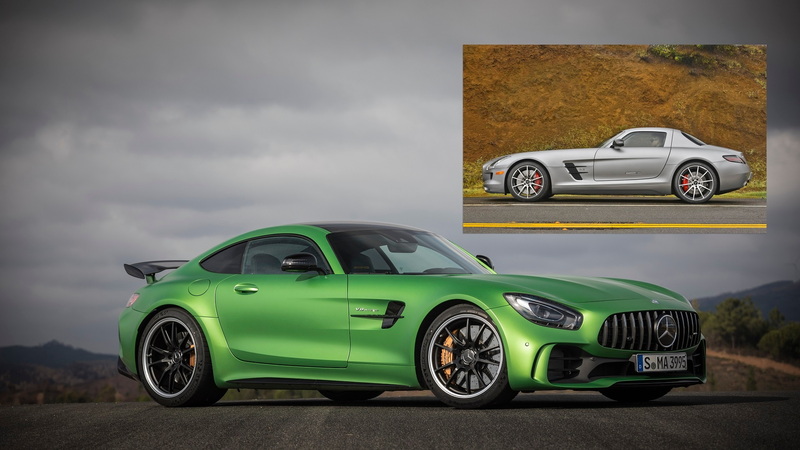 While that car made 583 horsepower, you can get a 469-hp 2017 Mercedes-AMG GT for as little as $113,395 and the top-of-the-line 577-horse AMG GT R comes in at just $157,995. Wolleson has the answer: "We had a lot of efforts in making the body in white itself easier to build--less welding, more riveting, more gluing, which is cheaper technology. We managed to get rid of the quite expensive structure for the gullwing doors. The gullwing doors are quite expensive. And all this leads to the cheaper price." Sometimes a platform just doesn't work in its first iteration. While the SLS was an engaging car to drive, it did have its foibles. It seems what it needed was a shorter wheelbase and a bit less weight. To our backsides, the GT just feels better. Wolleson provided his view of the changes in driving character: "The shortening of the wheelbase has got a big influence on the handling. We reduced the weight so it is a positive influence. This car is lighter, it's shorter, so all of this gives you more agility." More agile for less money? That's evolution we can believe in.